Born in Lambeth, London on September 19, 1867, Arthur Rackham was a prolific artist from a young age. Sneaking pencils into his bed to draw under the covers, he eventually resorted to drawing on his pillow case when paper was taken from him. 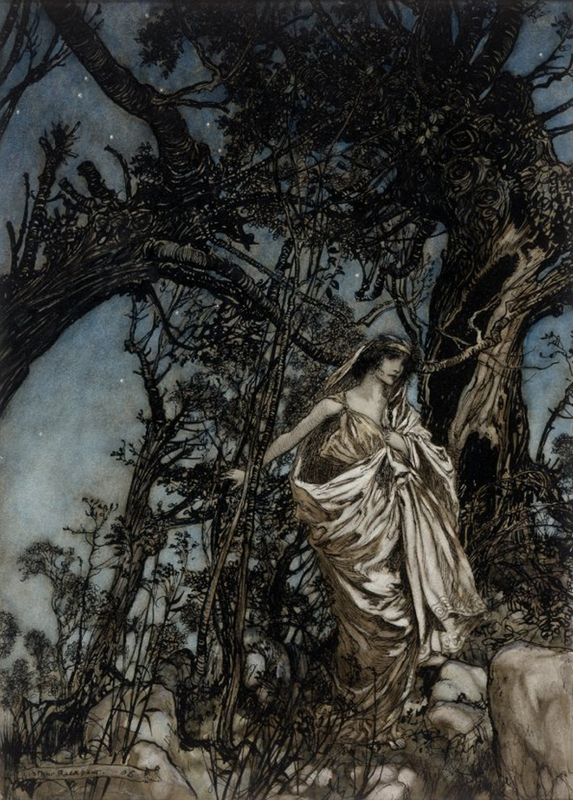 Inspired to become an artist while traveling to Australia in 1884, Rackham drew avidly during his journey, and also began painting in watercolor. Though his father insisted he enter the business sector, Rackham enrolled at the Lambeth School of Art, which he attended in the evenings after finishing a day’s work as a junior clerk in the Westminster Fire Office. He continued to work in the Fire Office until 1892, and labored tirelessly after business hours to produce drawings and watercolors to submit to illustrated newspapers. In 1888 a watercolor he painted of Winchelsea, Australia was accepted by the Royal Academy of Art and sold for two guineas. 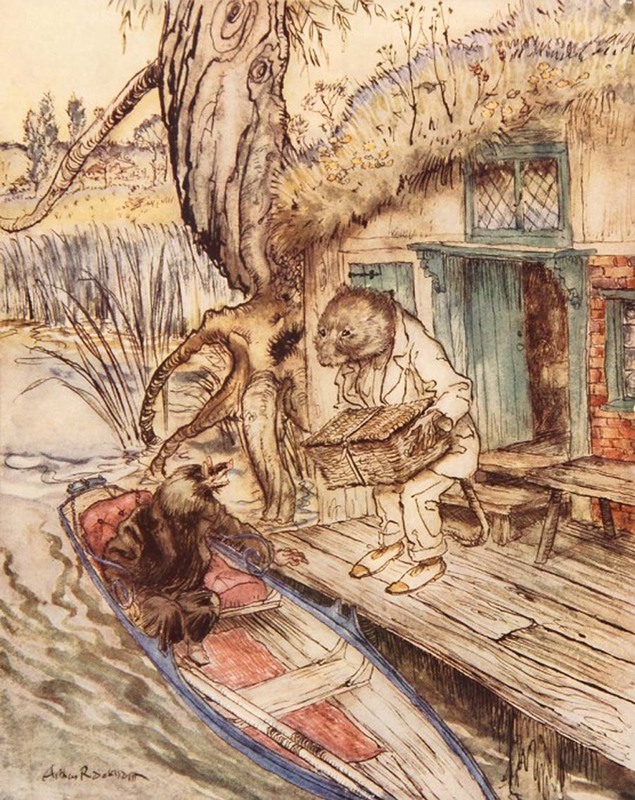 Beginning in 1892, Rackham began illustrating for the Westminster Budget Newspaper, a job he kept until 1896. The majority of the illustrations for the Westminster Budget were more conventional, and only a few submitted to this and other London newspapers showed his imaginative side. It was during this time that Rackham became particularly interested in book illustration, a place where he could focus his creative efforts. Rackham’s entrance into book illustration began with a guidebook of Canada and the United States entitled To the Other Side (1893), and later on, The Ingoldsby Legends (1898) and Tales from Shakespeare (1899) which were considered his two most successful illustrated books at the time. Both of these works were re-issued less than a decade later as deluxe editions (with additional illustrations by Rackham) due to his success at the turn of the century. The year 1900 marked the breakthrough of Rackham’s success as a book illustrator with the publication of his illustrated The Fairy Tales of the Brothers Grimm. This book featured ninety-nine black-and-white drawings with a color frontispiece. Two new editions were issued within ten years of the original, with new and edited illustrations by Rackham in each. The most notable of these editions is considered to be the one released in 1909. 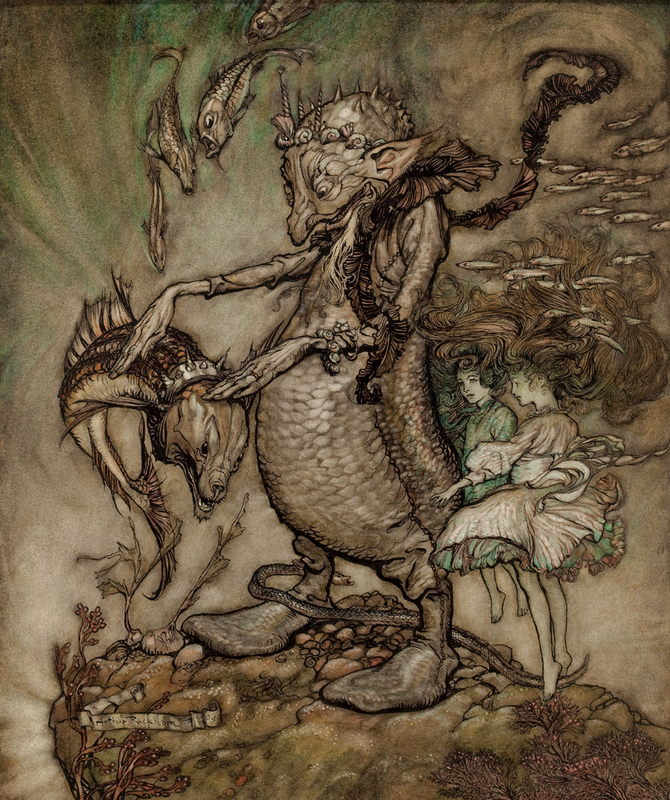 Rackham continued to succeed in his illustrations of fairy tales and fantasy stories, attributing the success to his intimate familiarity with the texts. Largely influenced by Aubrey Beardsley, George Cruikshank, Randolph Caldecott, and Richard Doyle during the beginning and height of his career, Rackham’s style remained unique and set him apart from contemporaries and competitors. The year 1900 was also a milestone for Rackham because of his marriage to Edyth Starkie, a portrait artist with whom he remained married until his death. In 1905, Rackham’s illustrated version of Rip van Winkle established him as the leading decorative illustrator of the Edwardian period. It was at this time that his illustrations began to be displayed in Leicester Galleries, London where nearly all included in Rip van Winkle sold during the exhibit. J.M. 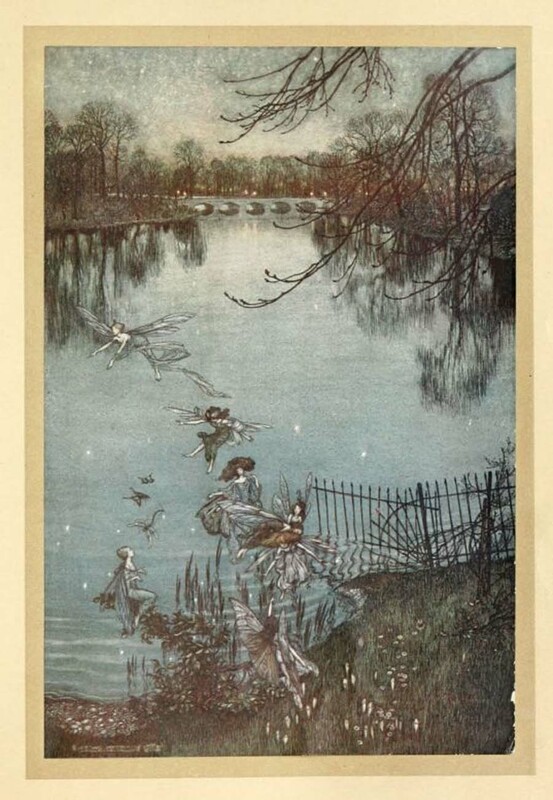 Barrie, author of Peter Pan, commissioned Rackham to illustrate the first edition of his classic children's tale Peter Pan in Kensington Gardens (1906) because of his enjoyment of Leicester Galleries’ exhibition of Rip van Winkle. After this monumental publication, Rackham was asked to illustrate another classic, Alice’s Adventures in Wonderland (1907), which proved to be much more controversial because of the already beloved version illustrated by John Tenniel. 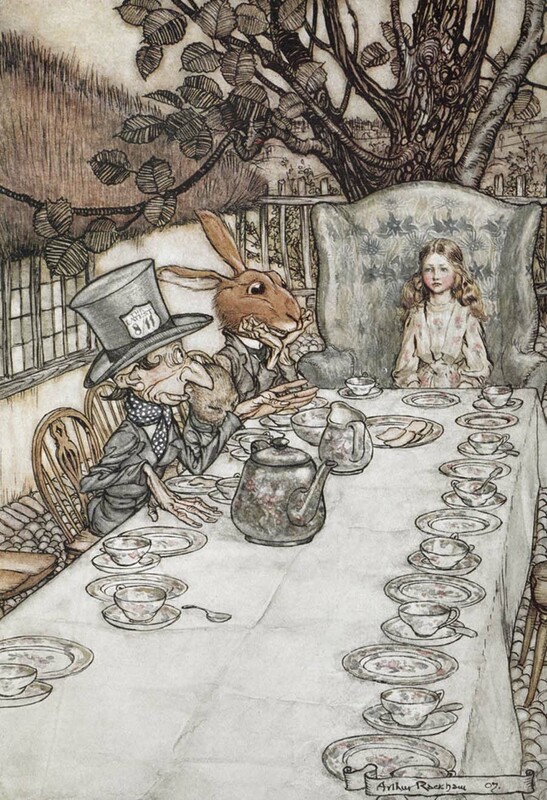 Nonetheless, Rackham’s watercolors for Lewis Carroll’s beloved story were largely a success, and it led to him illustrating other tales such as A Midsummer Night’s Dream (1908), Gulliver’s Travels (1909), Undine (1909), Aesop’s Fables (1912), Mother Goose (1913), A Christmas Carol (1915), The Romance of King Arthur (1917), Cinderella (1919), The Sleeping Beauty (1920), Comus (1921), The Tempest (1926), and The Legend of Sleepy Hollow (1928). During the early 1920s sales of Rackham’s books in Britain decreased while those in the United States were on the rise. 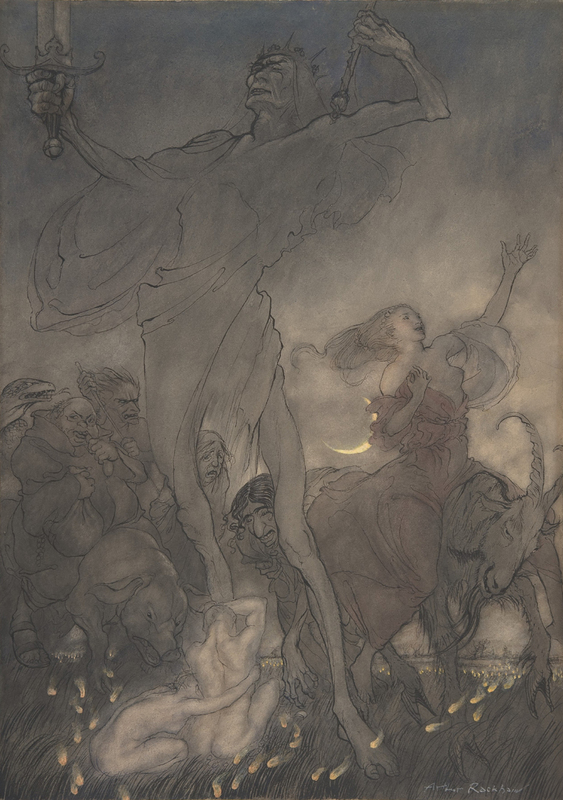 Exhibitions of Rackham’s work took place in New York City, and he received a substantial commission from the New York Public Library to create a series of watercolor paintings of A Midsummer Night’s Dream. The 1930s were trying for the Rackhams as Edyth’s health declined and shortly after, Rackham himself began to have health problems. Despite these trials, Rackham continued to produce numerous illustrations, both for reissued deluxe editions of his books, and additional commissions. Deluxe editions of classics such as The Night Before Christmas (1931), Fairy Tales by Hans Andersen (1932), Goblin Market (1933), and The Arthur Rackham Fairy Book (1933) were released throughout the early 1930s. 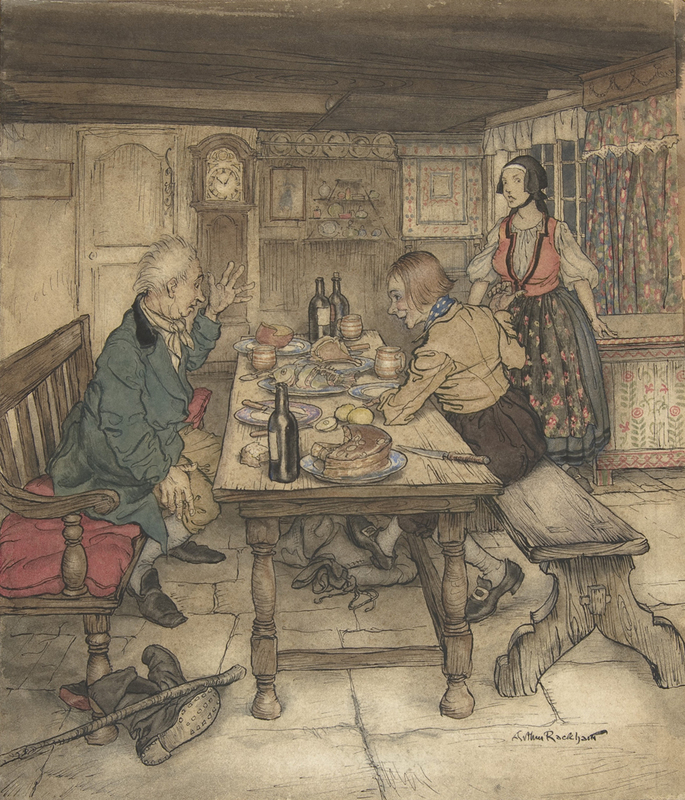 Rackham’s illustrations for Fairy Tales by Hans Andersen were especially successful, and the work was named the best picture book of the year by Hugh Walpole for The Observer in 1932. By 1936, exhibitions of Rackham’s work took place all over the world, though by now he was suffering from chronic illness and was unable to produce the magnitude of work he once had. 1. Derek Hudson, Arthur Rackham: His Life and Work (London: Heinemann, 1960), 150. Dalby, Richard. The Golden Age of Children's Book Illustration. London: Michael O'Mara, 1991. Hudson, Derek. 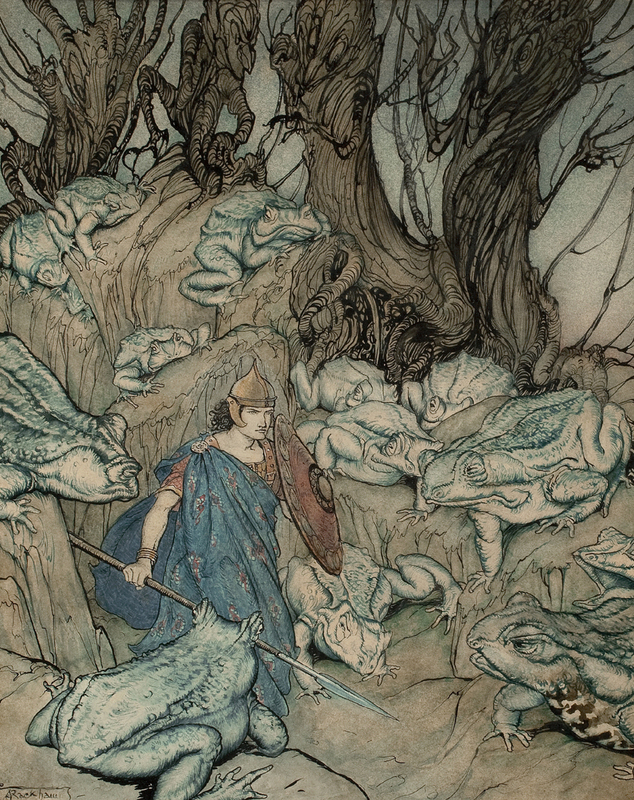 Arthur Rackham: His Life and Work. London: Heinemann, 1960. Rackham, Arthur. 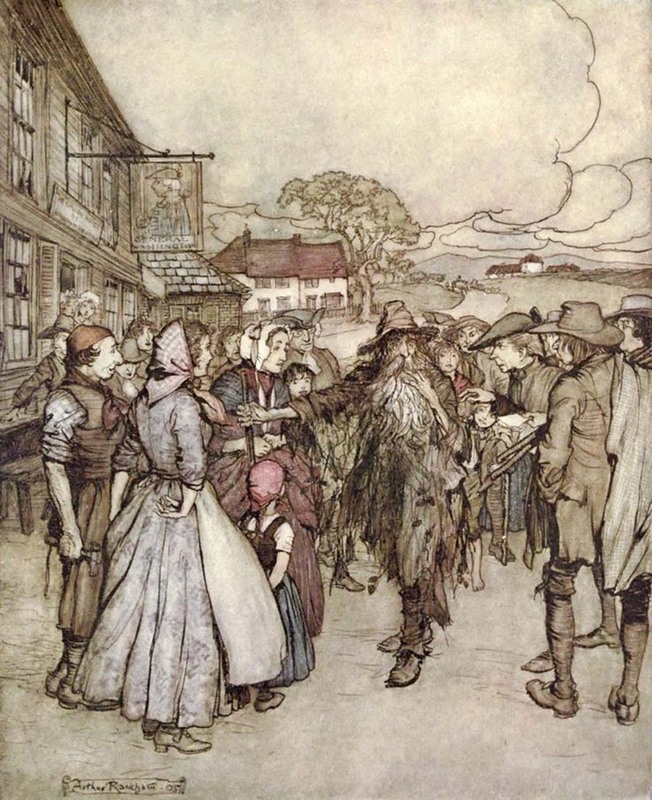 Arthur Rackham’s Book of Pictures. New York: Avenel, 1979.